Phoenix, the eaglet that (literally) rose from the ashes. Those who are following ‘Phoenix’ will be happy to know that the young eagle is doing well. His caretakers are waiting for Phoenix to moult and get a new set of feathers. Once Phoenix has a brand new set of feathers, to replace the burned ones, then flight training will begin. From there, we will have to see about Phoenix’s temperment and hunting skills to determine if he is releaseable. ‘Phoenix is doing great—eating whole foods (Rat, quail) and venison on his own. Beak and talons are still on the mend but look great considering. We are planning an event (probably this month) that will require you and/or Dr Folland to take part in—we’ve not yet discussed this with Dr F. We have someone coming from out of state to help us imp all of his flight feathers (tail and both wings). Imping is the process of grafting in a complete feather into the shaft of a broken feather. This is commonly done in birds of prey to either enable the bird to fly or, in the case of Pheonix, protect new emerging pin feathers. Without the protection of surrounding normal stiff mature feathers, emerging ‘pin’ feathers are at risk of breaking until they harden. 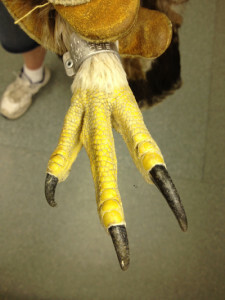 Pheonix the eaglet is still recovering from his burn wounds…. 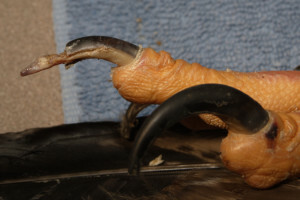 While this is not good, Pheonix can recover and grow a new covering on his beak and of course, a new nail. It will just take more time and close attention to detail to make sure he heals well. I have worked with countless birds including raptors (hawks, eagles, falcons, etc) and I can say that Pheonix is a real fighter and has a strong will to live. Once all of his wounds have healed, he will need to be kept for possibly up to a year. Pheonix will have to moult all of his burnt feathers and learn to hunt proficiently before he can be released back to the wild. To make donations, go to www.WRCNU.org. All income to run the WRCNU facilities and programs comes from private donations. 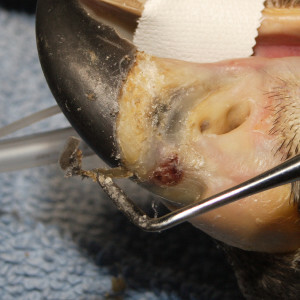 No federal funding is available as is typical of wildlife rescue organizations in Utah. If you are interested in volunteering, please contact DaLyn at WRCNU. Thank you for your interest in the story and I will keep you updated! As an avian veterinarian traveling and working around the country, I have been fortunate to work with some incredible people and amazing animals. Last week, I had the opportunity to work with ‘Phoenix’ a juvenile golden eagle that survived a wildfire near Salt Lake City, Utah. However, it is not simply the fact that the baby survived, but how he did it….. 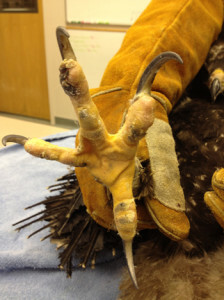 The golden eagle’s nest was well known and the baby (prior to being known as Phoenix) had been identified and leg banded by the Utah Division of Wildlife Resources. This baby’s life suddenly changed when an out of control wildfire, started by target shooters, ravaged 5,500 acres including the eagle’s nest. When a volunteer returned to check on the eagles after the fire had moved through the region, the nest was gone but the baby was found alive, burnt and huddled under a charred juniper tree over 40 feet below the nest location. Not only was the bird alive but the eagle’s parents had left a rabbit, food for the young bird, in an attempt to save their baby. Due to the extensive burns, the baby was not able to eat. After it was determined the baby could not survive, even with the parent’s help, the eaglet was taken to the Wildlife Rehabilitation Center of Northern Utah (WRCNU). 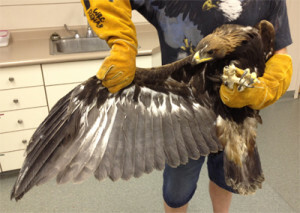 This baby eagle survived the fire, second and third degree burns, starvation and dehydration for 6 days! Under the care of wildlife specialist DaLyn Erickson, Buz Marthaler and the dedicated WRCNU staff, already overwhelmed with hundreds of orphaned native baby animals, the young eagle was named Phoenix and intense burn wound management began. All of the primary feathers, remiges [wing] and retrices [tail] were missing, burnt down to the shaft or melted showing the intense heat experienced. 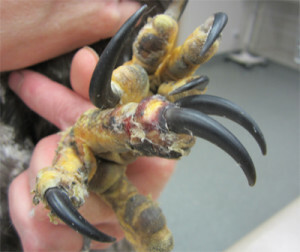 The feet had second and third degree burns explaining why this bird could not eat (golden eagles use their feet to hold down prey and use their beak to tear out bits of food). The bare facial skin also had second degree burns and about 25% of the coverts we singed or missing. Phoenix still has a ways to go before he can be released. First, all of his wounds must be completely healed (which I suspect will happen within the next 3-4 weeks). Second, he must moult and get an entirely new set of feathers prior to flying (this will take about 1 year). Third, he must be trained how to hunt and catch food- which can only begin after he regrows new feathers and learns to fly. As you can imagine, the Phoenix’s medical and long term care is, and will be, quite expensive. WRCNU needs your help! Phoenix’s care comes on top of their current workload of about 450 native orphaned and injured animals. Through Parrish Creek Veterinary Clinic, I work closely with WRCNU and am asking you to help by providing donations. Additionally, WRCNU is in need of volunteers! To make donations, go to www.WRCNU.org. All income to run the WRCNU facilities and programs comes from private donations. 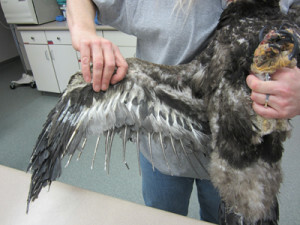 No federal funding is available as is typical of wildlife rescue organizations in Utah. If you are interested in volunteering, please contact DaLyn at WRCNU. Thanks so much for this update and photos and for all the work you do to help the WRCNU. I’ve been a volunteer there for over 2 years now, and I know you do so much for the animals brought in to the center. I am on leave from working at the WRCNU while I finish physical therapy for shoulder surgery, but I know how unbelievably busy this (baby animal) season is, even before they take on a special patient with extra needs (like Phoenix). I know that volunteers are much needed as well as any help with donations. It is very rewarding work. Again, thanks for the amazing work you do for our wildlife! What do volunteers do? How many hours would a “shift” be? I live in Cache Valley. Please contact WRCNU (www.wrcnu.org) for more details as to how you can help. WRCNU is 99.9% staffed by volunteers; we only have one paid emplyee (DaLyn). You can do it all if that is your desire, not special abilities, just a desire to help make a difference. Most of our work involves: food prep, feeding, cleaning (constantly and it’s NEVER enough) dishes, laundry … YOU NAME it probably needs to be done. Those with desires to work with and handle raptors one day can set that as a goal, but even our eagle handlers mop floors, feed baby songbirds, do dishes, etc. Not job too large or too small for anyone once you have the experience. Call us to setup an orientation appointment and take it from there–you set your own schedule by coordinating with the volunteer coordinator. I would like to send a donation, but do not like to put my information on-line. If you email me an address to mail a donation to, I would be glad to do so. Thank You for helping this most precious of birds. Also, please contact WRCNU (www.WRCNU.org) to get details as to how to donate to their organization. Go Phoenix!!! A special THANKS from one raptor rehab volunteer to many others!!! If I were rich… Thanks so much for sharing this story!! Please keep me poster as to Phoenix’s recovery progress… Keep up the attitude Phoenix!! I want to thank you for all the hard work you and the people at the WRCNU is doing for this beautiful golden eagle. I will making a donation to help with the care of this bird in the next few weeks and will continue to donate until he is able to fly on his own. Please tell the people at WRCNU that people in the great state of Missouri is pulling for this bird and I will see if I can get other people to donate also. I have donated to WRCNU for Phoenix as I think his story his extraordinary and he is meant to recover and live a normal life, with your help of course. I wish I lived closer to the center so that I could volunteer to help with all the work. Nothing I would love more… I am cheering for you from Connecticut though, so keep up the good work! On the “needs list” it has sheets listed. Are flat sheets acceptable? I can make specific sizes, ( like heating pad covers) from the sheets I have. This might help more. Many of these sheets are in new condition, and are just sitting on my shelf. Once in a while, someone rips off a section to clean with. I am in another state but would love to help and have watched Phoenix and his progress since the fires. Thank you for the physical mailing address. I will start a “care package” after this weekend and a donation too. Please contact WRCNU to find out exactly what they need. Please don’t forget to vote for WRCNU on the Chase Giving page so that they can win a GRANT to take care of this eagle and many many other animals. Don’t forget;They provide education too ! !